I own some microscopes manufactured by Stiassnie, and my surprise at the paucity of information on this optician persuaded me to write this brief monograph. It may be necessary to explain the creation of the firm of Maurice Stiassnie in 1882 by his family links and his relationship to Constant Vérick, his father-in-law. Vérick, an optician, was apprenticed with the title of “Special pupil” to the manufacturer of microscopes Edmund Hartnack, nephew of Georges Oberhaeuser (1798–1868), a well-known optician and microscope maker of the 19th Century. 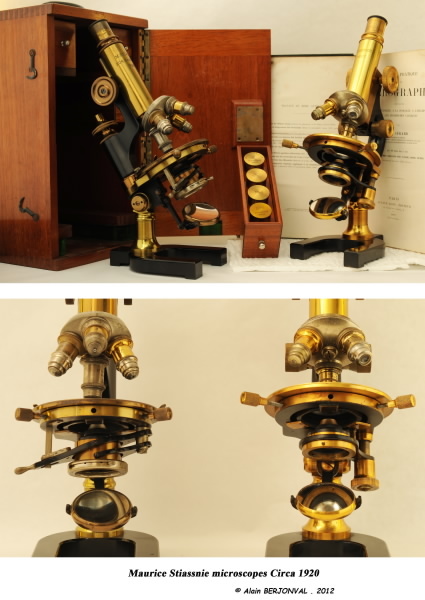 Edmund Hartnack (1826–1891) was a Prussian microscope manufacturer who learned his craft in Berlin. In 1857, he joined the instrument factory of his uncle Georges Oberhaeuser, at 21 place Dauphine in Paris: here they set up a partnership named “Oberhaeuser & Hartnack” from 1857 till 1860. In 1860, he created his own company “Hartnack & Co, Paris and Potsdam” at 21, Place Dauphine in Paris and at 39 WaisenStrasse in Potsdam from 1857 till 1860. He was one of the best opticians of his generation and a distinguished microscope maker of the second half of the 19th Century, with a reputation for high-quality products. A microscope similar to his statif VIII was depicted by Albert Edelfelt’s painting of 1885, showing Louis Pasteur at work in his laboratory. The Franco-Prussian conflict (1870 war) forced him to leave Paris in 1870 to manage the Potsdam factory. Vérick, after the departure of Edmund Hartnack, took over in 1870 a workshop specializing in the manufacture of microscopes (L’atelier Depenne), at 2 rue de la Parcheminerie, Paris, from 1870 until 1885. So, Stiassnie, through his family relationship with Vérick, was the heir to this family of microscope makers of the 19th Century. In fact, Stiassnie, son-in-law of Vérick, was the foreman at the Vérick workshop before succeeding to ownership in 1882. Initially, the Company settled down at 43 rue des Ecole until 1905, and then at 204, Boulevard Raspail in Paris. The signature on the body tube became “M. Stiassnie, Paris” or “M. Stiassnie, 204 Bd Raspail, Paris” instead of: “Mon Verick, M. Stiassnie Sucr, 43, rue des Ecoles, Paris”. In 1922 a new firm was created in partnership with the brother of Maurice Stiassnie under the name of “Stiassnie Frères, Paris”, based at 67, Boulevard Blanqui in the 13th district of Paris in1930 or 1936. During this period a range of different stands was developed, with a lot of laboratory accessories and such apparatus as microtomes. Unfortunately, the story of the firm ended sadly. After the second World War, the “Stiassnie Frères, Paris” company was unable to compete with the post-war German makers and went into bankruptcy. An attempt to relaunch the company under the name of “Sté Nouvelle de Microscopie Stiassnie” failed in 1970. 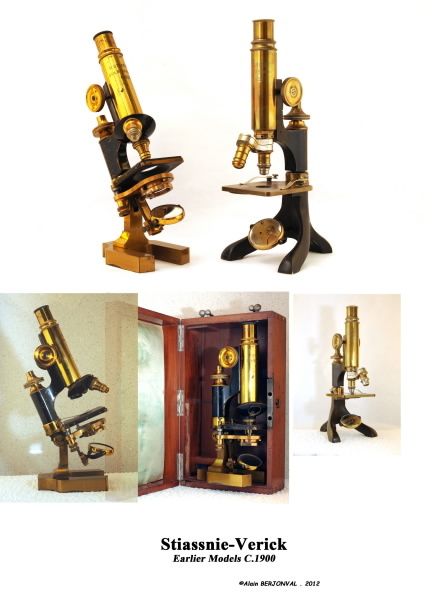 I include some extracts of the 1905 catalogue showing the then microscope range, photos of some earlier Stiassnie microscopes c. 1900, and some models from c. 1920 & 1930. Bracegirdle, B. 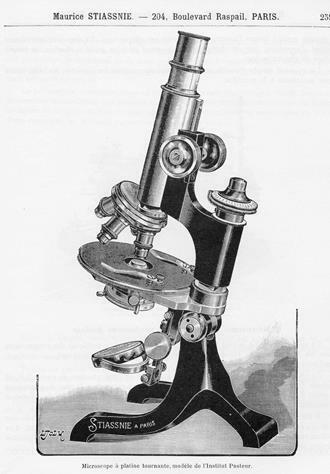 (1996) – Notes on Modern Microscope Manufacturers. London: QMC. 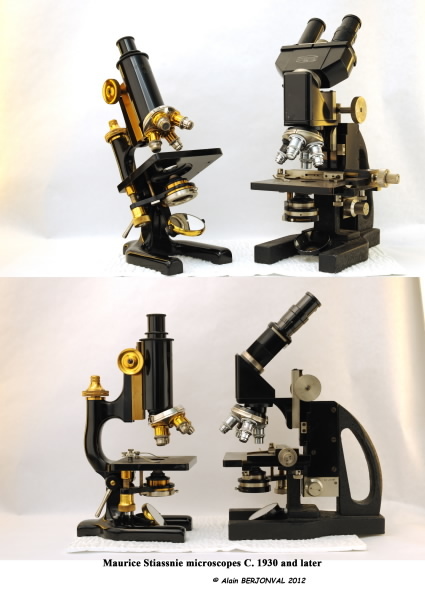 CNAM (2010) – Catalogue et prix courant des Microscopes et appareils accessoires pour les études micrographiques, Auteur: Maurice Stiassnie. 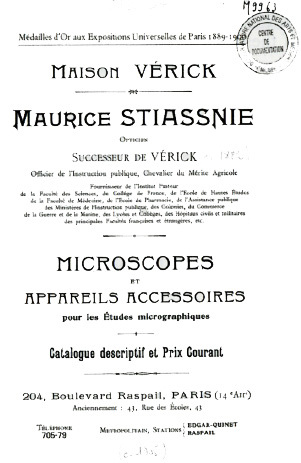 Stiassnie, M. (1905) – Catalogue des Microscopes et appareils accessoires pour les études micrographiques.